Got my 42mm Apple Watch today, and the first thing I did was put it side-by-side next to my Motorola Moto 360 Android watch. The 42mm actually seems a bit smaller than the Moto 360, but I don’t really mind. I think the Apple Watch is a bit more polished, and just looks better. If there was any doubt that the 42mm might be too big (compared to the 38mm), that doubt is now gone. 42mm is not big. Feels “just right”. 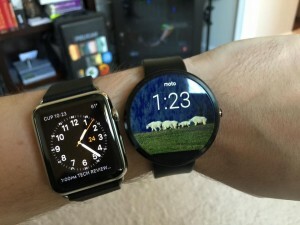 This entry was posted in Apple Watch and tagged Apple Watch, Moto360, Size comparisson, Smartwatch on April 24, 2015 by David. If you were lucky enough to get in early on the pre-orders, your Apple Watch should be arriving later this week! One of the cool features about the watch is that it comes with its own storage, and Bluetooth capabilities. What this means is that YES, you can finally have music on your run when you take ONLY your watch! 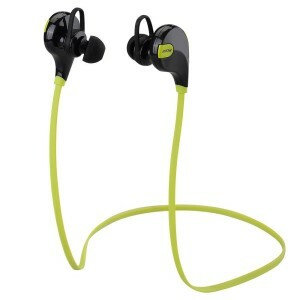 If you need a pair of decent Bluetooth headphones for workouts / jogging, Amazon has a great deal on these today. Regular $69, on sale for $22 after using code PDB68PMR. I’ve been waiting for a deal like this. This should also work with Android Wear. This entry was posted in Apple, Apple Watch and tagged Apple Watch, Audio on April 21, 2015 by David.